I am invited to give a speech about congestion and sprawl in Port St. Lucie. I accept an offer by the hosts to paddle the St. Lucie River. North Fork. Two hours of paddling reveals a surprisingly intimate, narrow, quiet, peaceful river. 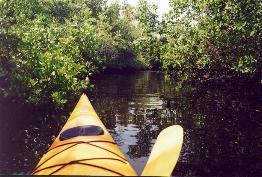 We start out in a large "sea lane" section near the coast, but are soon within a modestly-scaled, mangrove-lined section of the creek. Very little tree canopy along the way. Lots of flying mullet. I am told that the river is substantially affected by tidal action from the Atlantic Ocean. Later, I tour Abacoa with a friend. I am impressed by the walkable design and the human-scaled, brand new town center. My only quibble is that the town center is not within walking distance of the residential areas.